• Twin Wall Stainless Steel Flue Liners, etc. We also install models which we do not have in our offer. We do all of the necessary building work according to applicable building standards and with full manufacturer's guarantee. MK-solutions performs Chimney Sweep which is required by the home / house insurers. 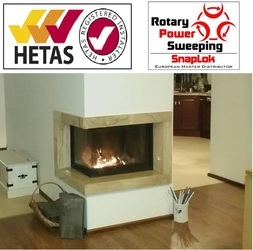 Every chimney has to be cleaned at least once a year by authorised personnel - HETAS REGISTERED INSTALLER. SPECIAL! We do Chimney Sweep on Wedding Day + photo session! Free delivery in West Midlands available!